Due to high-emphasis on safety required throughout racking systems, we have developed the TTF Double Deep Racking System. 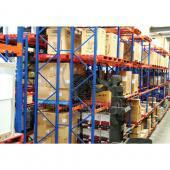 Designed to 2 pallets deep or 4 pallets deep in a double entry rack to suit most warehousing conditions. With a floor utilization capacity of 60%, this system offers optional storage accessories for awkward and non-standard loads. 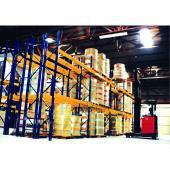 it gives 50% immediate accessibility and an average stock rotation performance.